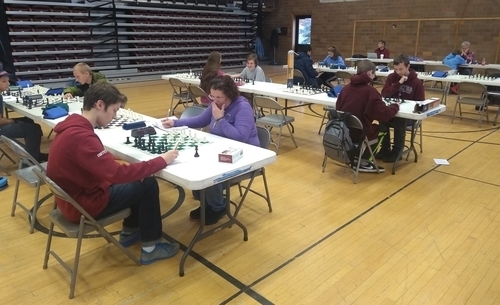 11.08.18 Maine Central Institute, a high school in Pittsfield, Maine, hosted its first US Chess rated tournament on Saturday, November 3, 2018. The tournament, dubbed Chess Madness at MCI by its organizers, attracted twenty-one players in three sections. Here's the illustrated tournament report. 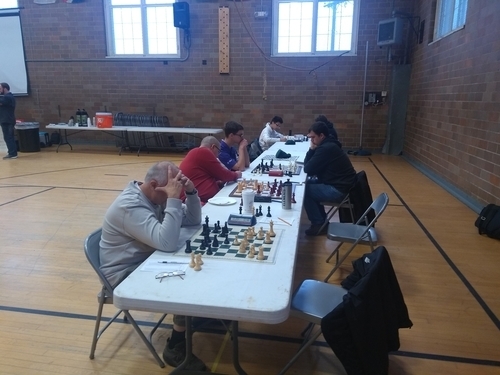 Players compete in the U800 and U1600 sections of the Chess Madness at MCI tournament played on November 3, 2018 at Maine Central Institute in Pittsfield, Maine. Thanks to Michael Dudley and Ian Villmore for contributing to this report. The results in the Open section lived up to the tournament's name as they were, by all accounts, Mad! A four-way tie for first ensued between Ben Mock, Rob Shore, Stephen Morse, and Michael Dudley all scoring 2.0 points in three rounds. Trailing the leading group were: Wyatt Hendrix (1.0) and Nathan Gates (0.0). In the U1600 section, Tommy Owen finished first with 2.5 points in three games. 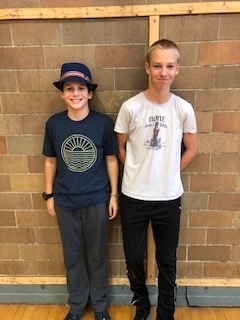 Owen was followed by: Evan Smith (2.0), Tristan Cousineau (1.5), and Roland Garbe (0.0). David Wilcox went perfect on the day to take first place in the U800 section with 4.0 points in four games. 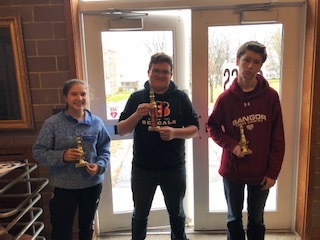 Prince Wang, Tobias Coffey, and Clara Parker finished equal second with 3.0 points. It's always pleasing to see tournament chess being played at new schools and venues. We would like to thank organizer and MCI chess coach Ian Villmore and tournament director Michael Dudley for making this happen. We hope to see many more tournaments at MCI! From the left: Robert Shore, Nathan Gates, Ben Mock, and Stephen Morse in the six-person Open section. The winners from the U1600 section: Tommy Owen (left) and Evan Smith. The winners from the U800 section: David Wilcox (center), Tobias Coffey (right) and Clara Parker (left). Since there were no players in the U1200 section, organizers handed out trophies to the winningest unrated players at the tournament. 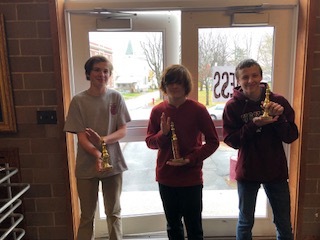 Pictured here are: Brayden Higgins (center), Josh Baker (right) and Dylan Wright (left).